If you’re training for an endurance race like a half marathon, marathon or triathlon, you’ve probably read that you need to incorporate sports drinks or gels or bars at some point during your long workout sessions. But if you’re new to endurance training and are used to drinking just water during your workouts, the transition can be confusing. During any workout up to one hour, plain water is fine. In fact, if you’re a just a regular gym rat (read: not training for anything) you should stick to just water. Consider this: a woman weighing 150 pounds burns 98 calories per mile run. The average sports drink contains 125 calories per bottle. That means you’d have to run roughly 1.25 miles before you actually start burning more calories than you’ve consumed. For those of us who are tackling training runs/rides in excess of an hour, it’s recommended to consume 100 calories or 30 grams of carbohydrate (drink or gel) for every hour beyond the 60 minute mark. 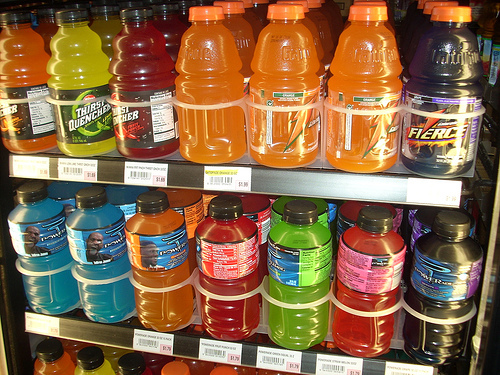 As for what to eat and/or drink, I prefer the fruity sports snacks like Gatorade, Powerade and Clif Shot Bloks. Gu is also good if you’re looking for something really sweet. And here’s a tip if you’re planning on consuming the Bloks or Gu during a race…make sure you eat it near a water station. You’re going to need the water to wash that stuff down because it has a tendency of sticking your jaw shut. This entry was posted on February 24, 2011 at 7:08 am and is filed under Running, Triathlons. You can follow any responses to this entry through the RSS 2.0 feed. You can leave a response, or trackback from your own site.